C.S. 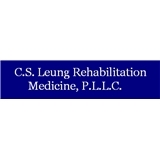 Leung Rehabilitation Medicine (New York) - Book Appointment Online! Dr Leung was amazing. Made me feel so comfortable, explained thing well, was caring, asked questions, was attentive to details, and helped with my lower back pain so much. Def recommend!